Look what they did at San Francisco's City Hall! They dug up the whole lawn and planted a garden — an edible garden! 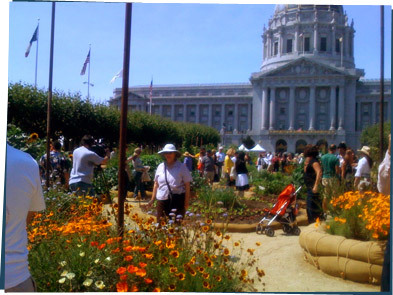 They did it to show how important it is to have self-sufficient community gardens as one way to grow food. Hey, cool! I wish our City Hall had food out front. But who gets to eat the stuff they grow? It can't feed the whole city. They donated the harvest to people in need who don't have access to fresh organic veggies. You're right, one garden can't feed the whole city, but what if everyone turned their lawns into gardens? Food for thought!